Ratnamati or Lodrö Rinchen (in Tibetan) is a bodhisattva emanation of the Dharmakaya Buddha Vajradhara. Together with the Bodhisattva Sukhanatha, (an emanation of Vajrapani), he is responsible for bringing the Mahamudra teachings into our human world. 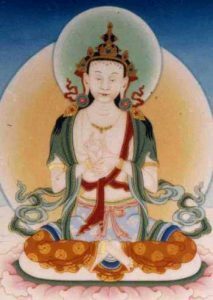 They transmitted the teachings of Mahamudra to the Indian Mahasiddha Saraha, who in turn passed them on to his human disciples. It passed from him to Nagarjuna, Savaripa and then to Maitripa. This is one of the two Mahamudra lineages which Marpa Lotsawa received in India and brought back to Tibet.